This guide is written specifically for the Empire side but the strategy used here should work also for the Republic side. Hello everyone, the heroic dailies on Belsaivs (2x Heroic 4+, 1 x Heroic 2+) and Ilum (1x Heroic 2+) can be a great way to make some credits (about 13 k credits) and daily commendations (3 commendations) for your Rakata implants/earpiece. If you play on a low population server or odd hours of the day it can be hard to find a group to do them. Luckily, if you have a geared out companion (healer or tank), you can solo all of these heroic dailies. Of course, you can also do all of them with a partner to make it even easier! For reference, the companion I use for soloing these dailies as an inquisitor is Xalek (tank companion). He is pretty much in full Columi and has about 20 k hp self buffed. You might need to invest in Rakata Command stim if you have biochem as one of your crew skills or get some of those medpaks that heal both you and your companion if need. I will rank the soloability of these heroic dailies below. Lights Out (Belsavis, Heroic 4+): Very easy to solo, just need a (tank) companion that can survive a couple seconds. Freeing the Fallen (Belsavis, Heroic 2+). Also quite easy, the last boss isn’t too diffcult to defeat and can be done by pretty much anyone with a companion. Old enemies (Belsavis, Heroic 4+): The last boss you need to kill is very easy to get to but hard to kill. He hits pretty hard and below 50% he will heal himself. A decently geared tank companion for a healer player or a decently geared healer companion for a tank player might be necessary in order to solo this daily. A very well geared DPS player might be also to solo this with a decent healer companion. An interrupt with 10-12 second cooldown is a must for the last 50% unless you can out DPS the heal. Poisonous Strategy (Ilum, heroic 2+): While this is labeled as a heroic 2+, it is very misleading. It has the difficulty of almost a heroic 4+. A decent tank companion for a healer player or a decent healer companion for a tank player/DPS player will be required. If you strip naked(i.e. remove everything but relics and ear/implants to your inventory), you do not take a durability hit when you die and do not need to pay the repair costs. In Lights Out, Old enemies, and Freeing the Fallen, if you die within the “instance” you will be given a choice of a medical probe and revive right where you died. The first time you die, the cooldown on the revive probe is 10 seconds, 30 seconds for the 2nd time, 2 minutes for the 3rd and 10 minutes for the 4th. This increasing cooldown resets after a while (not exactly sure but seems to be within 20-30 minutes). Players with stealth abilities can avoid quite a lot of the deaths, especially in Lights Out. If you do it properly, you will die exactly 3 times in this heroic daily and on the 3rd death you can simply choose to revive back at the Medical Center to turn in the quest. Once you enter the “instance”, stripe down and hug the left wall closely. If you follow the left wall, you will not aggro any mobs. Once you get here, stop. Send your companion to the mobs guarding the staircase and then run up the stairs and activate the console. If you do not have a run speed boost like force speed, you will need to run up the stairs immediately after your companion enrages the mobs. If you do, you can wait a couple seconds to make sure they all attack your companion. After you have revived by the medical probe, you will have a 10 second window where you can invis and can move around without being attacked. Quickly move near the middle staircase. You need to set your camera to max zoom out range in the preferences. This allow you to target the Field Commander champion in the back. Send your companion after him. Your companion won’t be attacked by the mobs near the staircase. Once your companion is engaged in combat, quickly target a mob by the staircase and send your companion after that mob immediately. This will occupy both the Field Commander and the group of mobs below, allowing you to run up the staircase and use the console. You will die again here and you can move to the last console. 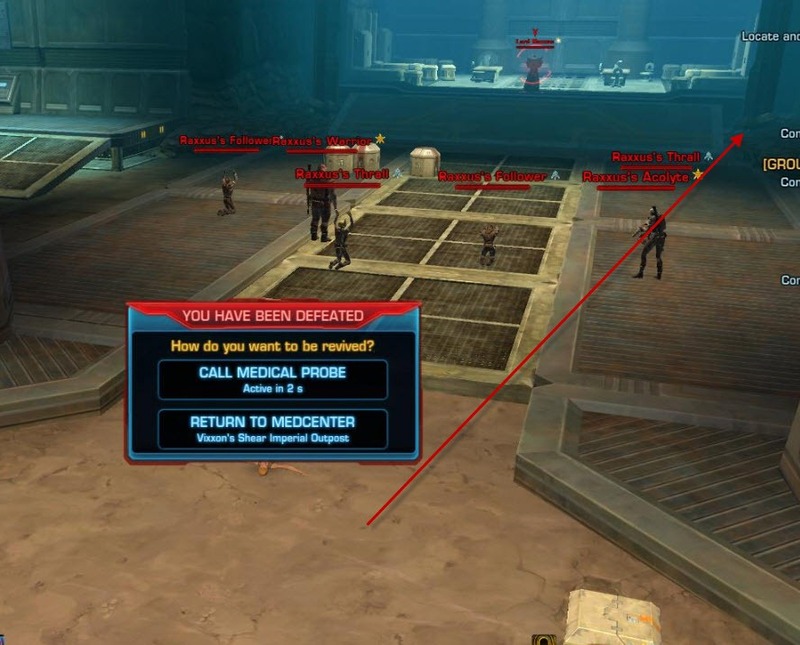 Same strategy as the first console, this time when you die after clicking the console you can choose to revive at the Med Center instead to turn in the quest. Takes about 5 minutes to finish this daily. Here is a video showing you how I “hug” the wall and clicking the first two consoles. 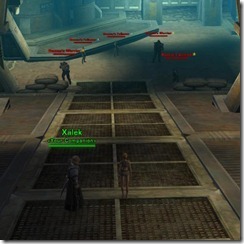 As usual, stripe down naked and send your companion after the first pack of mobs while you run further down into the instance. Not far from the first pack is the 2nd pack of mobs. If you time it right, you can make it past the 2nd pack of mobs before dying. Once you die, revive and run to the 3rd pack of mobs. Watch for the pathers around the middle area and try not to get aggro. Heal up and then run past the 3rd pack of mobs so you die near where Jedi Master Averon is sitting. 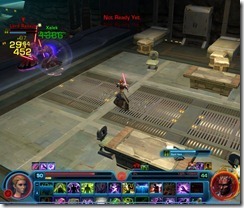 After reviving, it is simply a matter of killing Jedi Master Averon. Try not to stay near the boss if you are a ranged/healer as he does have a nasty proximity AoE and there is no reason to make the fight harder. He doesn’t hit too hard and dies pretty quick so you should not have much trouble defeating him. Expect to spend about 5 minutes finishing up this heroic daily! Getting to the objective – Lord Raxxus is not hard. As usual, stripe down and send your companion after the first pack of mobs so you can run past them and die. The 2nd pack of mobs in the corner can be avoided if you hug the left wall closely. After the 2nd pack of mobs, you will enter a big room full of mobs. Send your companion in while you run towards Lord Raxxus. Your goal is the corner indicated by the tip of the arrow. Heal up in that corner and then enrage Lord Raxxus where he is standing. Lord Raxxus has 160 k hp. The first 50% isn’t bad but past 50% he will cast his Dark Heal every 15 seconds or so. Be ready to interrupt him asap or you might stay here for a while. Lord Raxxus hits very hard so a decently geared tank/healer companion is a must. This daily is outdoors, which means that if you die, you will be sent back to the med center and have to run back. Your goal here is clicking the console next to the little huts. Each hut is guarded by 3 strong Republic Lookout Droids and 1 elite Republic Patroller. You will need some form of Crowd Control (CC) abilities here or you might have a tough time with this daily. The following narration is from a healer + tank companion perspective. Tanks/DPS with healer companions will have to switch it up a little. Make sure to turn all AoE attacks off on your companion and then send your companion after the strong droids. The elite Republic Patroller is ranged and can be CC’ed where he is standing. 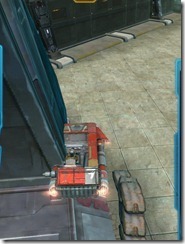 These droids hit hard and will jump next to you to attack you if your companion do not have all the aggro. You will need to be able to take a beating from the droids while your companion finish them off. Re-CC the elite patroller if need and kill him after you are finished with the droids. Make sure to heal up and buff up your companion before proceeding with the next time. As soon you click on the console, run away from it and leave your tank companion stand there (once again make sure all AOE attacks are turned off – Consuming Essence and Force Bomb on Xalek). 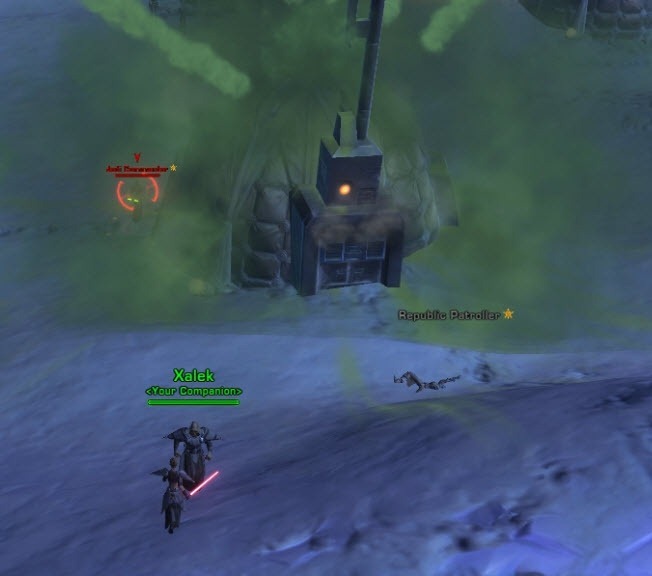 Two elite Jedi will spawn and mask their entry with a green cloud. 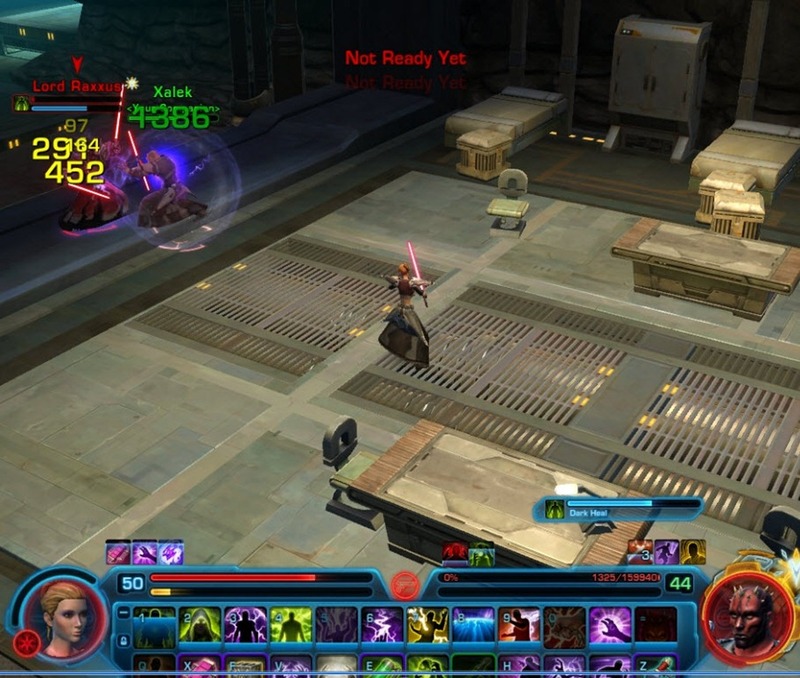 Stun / CC one right away and hopefully your companion will jump on the other Jedi that is not CC’ed. 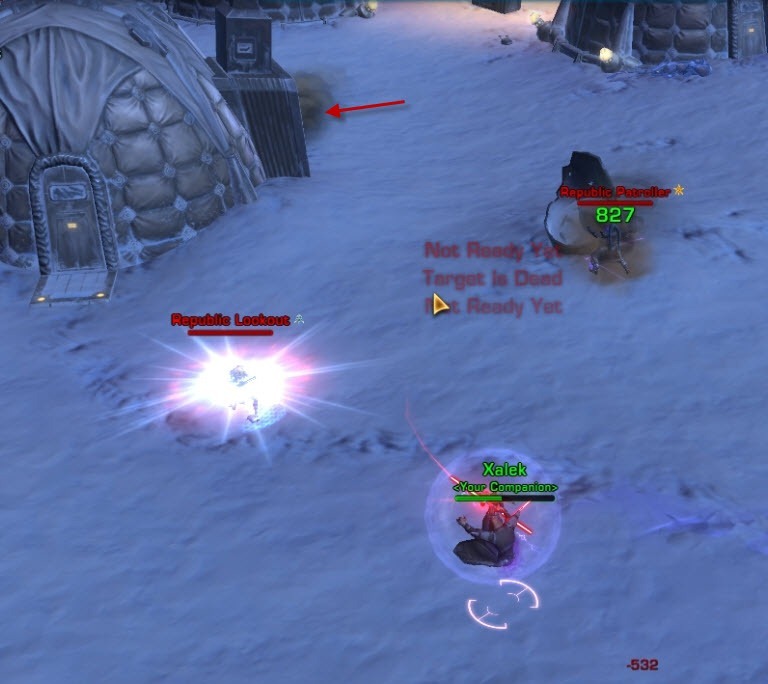 These Jedi mobs like to interrupt your CC abilities so stunning them prior to CCing helps to avoid that. Make sure you stand far from these two mob as they have a very nasty proximity AoE. Interrupt Forcequake if you see them casting it. Having the other Jedi cc’ed will make the damage manageable. If you die to the Jedi mobs, you will have to run back and find a different hut/console to click (and have to kill the 3 droids + patroller again). In Freeing the Fallen, the droids will attack the Jedi Master, if you die close to him while still aggroing them. For Lights Out, you can survive after pressing the button: just run very close to the right/left wall, and there are some areas “out of the heroic zone” in which you lose aggro and go out of combat. 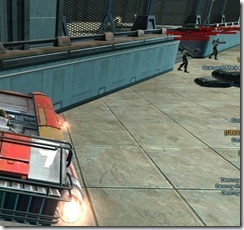 If you avoid the patrol, you can reach the middle console from the right, without aggro. I tried old enemies a couple of time, but i couldn’t solo Lord Raxxus as Dps (my Xalek is not so well equipped…). Ah cool good to know, especially the jedi master one 🙂 thanks! Very helpful tips, that’s more or less what I do too except that I’ve not been able to solo Old Enemies as dps with either Xalek or Talos. I find the Ilum daily much easier in comparison. Good to know that it can be soloed with a geared up Xalek. Which stats do you prioritize; defense, absorption, shield? Since it seems that absorption/shield doesn’t affect Xalek at all. On another note, great work with the site. Have been following the blog for a while. Good to be able to get pointers from a raiding sorc’s perspective. Xalek is bugged, shield/absorbtion wont affect him so he isn’t a good tank until its fixed. Plenty people have moaned and my ticket says its forwarded to the appropriate team. As a class that can spec into both DPS and Tanking gear, if you possess a nearly complete set of Columi level tanking gear, you can kill Raxxus while DPS specced as long as you have a decently geared healing companion (and utilize your tanking cooldowns intelligently). I have a feeling this is going to be long if not hard for bounty hunter healers as they don’t really have a good interrupt to handle his heals past 50% hehe. As a 50 Sorc in a combination of Columi, Rakata and Moddable gear (24 lvl mod/enhance, 25 lvl armor) the only one that gives me any trouble at all is Old Enemies. 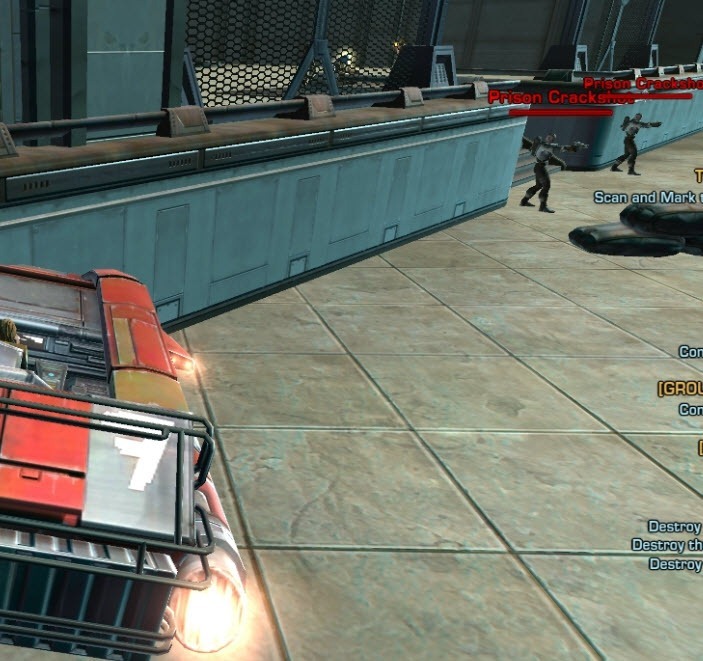 I use Khem because pound for pound he’s a better tank than Xalek. I have him in all high lvl Synthweave gear and crafted implant/ear. The only issue I have is getting a rotation down for interrupting Raxxus’ heals. Once I get in to a rhythm it’s smooth sailing. The other ones are cake. The only exception being getting two Shadows on Poisonous Strat. Holy crap that can be frustrating as a healing spec. When I was full madness, no matter what I got on that daily it was cake. Not having insta-cast WW even with Electrocute is tough. Good guide. It gave me the confidence to try Old Enemies solo and I have yet to die on it! Khem is getting some decent stuff now that our warriors are all decked out in Rakata hehe, Can’t wait to take him out again! Also gearing out Andro on the side, wondering if that could make some fights a bit easier. The cooldown on the res in an instanced part gets reset by ressing back at camp. Making it possible to do all 3 heroics on Belsavis in 10 mins or less. oh very nice, thanks for sharing! 🙂 Did not know that! well, as long as you can jump down and only fight the commander, its not a deal breaker. I dont really want to fight the mob at the stairs along with him though. 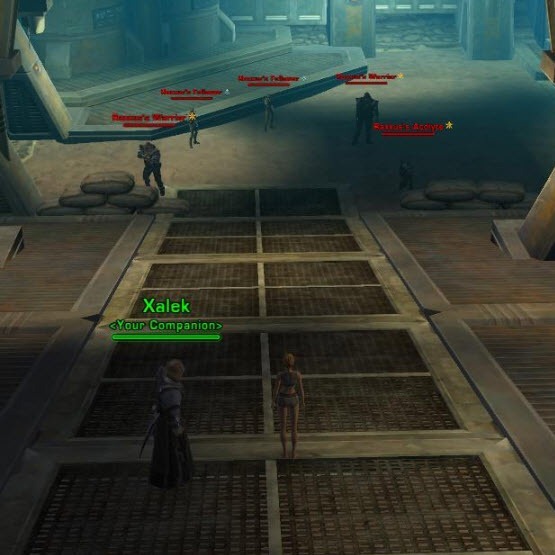 Has anyone tried Freeing the Fallen now that Jedi Master Averon is lvl 50 champ? I tried Lights Out today with my concealment IA. Before I was able to destroy the generators as my companion tanked. This is no longer an option as you get the ” You cannot do that in combat” text. /sigh. Update on the Daily H’s after 1.2: All daily-heroic-mission have been changed to H2’s. The Ilum daily has imo not changed at all. On the Belsavis Q they adjusted the mob-lvl from 42 to 50 for Master Averon and Lord Raxxus. Lord Raxxus has also been significantly nerfed: He won’t heal himself anymore and his dmg output has been rapidly lowered. Before 1.2 soloing him was hard for tanks and for many other classes (nearly) impossible, now a decent equiped Assasin tank can solo him even without a healing companion active. The Q “Light’s out” has also changed alot. Before 1.2 you could abuse the mechanics as described above, even without dying by runnig towards the wall or vanishing (Assasin/Operative) and therefore solo it easy. Now they adjusted the trashmob placement and made it impossible to activate the generator while in combat. Also they included a step that requires you to kill the Field Commander Boss mob in front of the middelst generator. His dmg output has also been lowered and he is easy soloable even without healing/tanking companion. All in al you’ll now have to kill at least two trash mob groups of each 3-4 hard and one champion mob guarding the left and right generator and the Field Commander in front of the central generator (as Assasin/Operative) to complete the Q. Non-stealther classes need to kill also one trash mob group infront of the Field Commander. Resetting engaged mobs bye runnig towards the outer wall is no longer possible because you don’t accidently leave the area bye that anymore. The rewards on all H2’s haven’t changed at all. 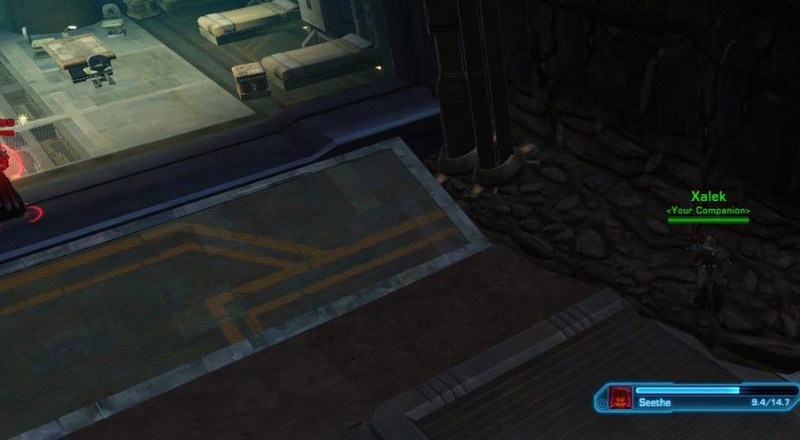 As a recent 50 sorcerer in blue gears and not that great companion gears as well, I wasn’t able to kill the champions, Raxxus, Field Commander, Jedi Master Averon with my tank companions. Instead, I killed them using Talos, the healer companion and kiting the bosses non stop around pillars while keep force shields up, dotting, slowing and stunning them.